The India women team’s popularity in the World Cup had less to do with the TV coverage and more to do with the fact that the team did well. By beating England in the decider of the ODI series in Nagpur, the India women's team earned a happy break from a breakneck season. The women have played non-stop cricket since December when the domestic tournaments started. It was a period that began and ended in darkness; from the anonymity of the domestic circuit to the ignominy of a live stream dying on their winning moments. In between though, were some bright spots that everybody got to see. None outshone Smriti Mandhana, who has been in incandescent form since a disappointing World Cup 2017. One of the criticisms of the elegant left-hander was that she was more comfortable scoring away from home, and struggled in Indian conditions. Before the home season, Mandhana’s average on Indian soil was 23.05 in ODIs. It now reads a much healthier 31.25, along with an away average of 63.55. Perhaps there can be no higher compliment to her consistency than the fact that India had started counting on her to score, much like they did on Mithali Raj until a few years ago. 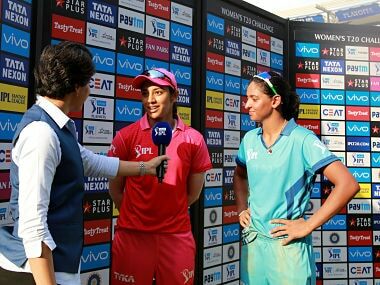 Even in a series played in spin-friendly conditions, Mandhana accumulated 181 runs in three innings, at a strike rate of “the slowest I’ve ever batted in international cricket”. The only criticism is that she did not convert her fifties to hundreds. India’s series win means they have now won three of the past five series, but in both wins and losses chinks were exposed, areas of concern underlined, and strange selection decisions made. Jemimah Rodrigues had shown enough promise to lock in the opening slot, yet was kept out of the XI by Devika Vaidya, who does not open in domestic cricket. Pooja Vastrakar too has proven to be a long-term investment, despite not yet having an ODI wicket to her name. Yet India began with Shikha Pandey, despite her not finding the form that she showed this time last year. Harmanpreet Kaur’s last dismissal – mis-hitting a full toss straight to mid on — epitomised her struggles since the ODIs against Australia. Perhaps the pressure of expectations, with people invoking her 171* in the World Cup sem-final against Australia every time, got to her. And Veda Krishnamurthy must have felt like a tennis ball, now in the team, now out, and finally pushed to bat at No 3 in the last game. Raj’s series-clinching half-century, her record 50th overall, came after nine innings, and was a welcome return to runs. The bowling and fielding showed occasional signs of fatigue though. Only with a helpful surface did India seem threatening, and even then the bowlers often struggled to put six balls in the same place. Fielding standards oscillated in direct proportion to the state of the match; the players were getting to the ball, which showed no lack of fitness, but they often fumbled. Confidence can be a fickle thing; just ask wicketkeeper Sushma Verma, whose showing is still a concern. The surfaces themselves became a talking point, with turning wickets finally appearing at the end of the home season. India rolled out featherbeds against Australia in Vadodara and Mumbai, and duly rolled over, winning only one game in seven, with even that win coming on the slowest of those surfaces. So it was no surprise that a dry turner greeted England in Nagpur, and in the first ODI it dished out the most thrilling match of the season, one that played out just like the World Cup final but with the opposite result. In a world where flat pitches that breed sixes and fours are seen as the best way to grow the women’s game, it was a reminder that thrilling finishes also get people talking. Part of the charm of the ICC Women’s Championship is the opportunity to play home and away in alternate cycles, and it is important that the pitches in each country reflect the local conditions, while still providing a spectacle. The two are not mutually exclusive. The cricket though, was overshadowed by the lack of telecast for this series, despite the BCCI in principle extending their contract with Star. Instead, the series was live streamed on the BCCI website, with each game marred by sporadic blackouts. A number of different reasons were provided for the absence of coverage, from a delay in the paperwork to a lack of clearance from the ministry of information and broadcasting. One may suggest that once the Indian Premier League (IPL) began, few had time to fry smaller fish. But the performance of the team shares some of the guilt. The Indian team’s popularity in the World Cup had less to do with the TV coverage and more to do with the fact that the team did well. The extensive broadcast provided to the home season was a direct result of that, and the broadcaster would have hoped for a good showing from the home side. But the results were certainly disheartening. Had India put up a better show in the ODIs against Australia, or made the final of the tri-series, the broadcaster might have shown more urgency in completing the formalities and ensuring this series was on TV. Unlike for the men, female cricketers carry the unfair burden of continually having to prove that the game is worth investing in.